Provide comfort for the family of Sharon Millett with a meaningful gesture of sympathy. 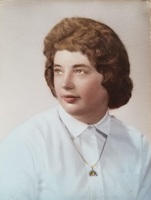 Sharon Ann Millett, 75, passed away unexpectedly April 4, 2019 at a Bangor hospital. She was born August 5, 1943, the daughter of Warren and Pearl (Fowler) Hurd. Sharon graduated from Bangor High School in 1962. She married her lifelong love of 52 plus years, William Millet, May 14, 1966. She was a homemaker and foster mom to 22 foster children, as well as her two biological children. Sharon enjoyed cooking, knitting, and sewing. In addition to her parents, she was predeceased by her three brothers; as well as her daughter. A Liturgy outside of Mass will be held 10:00 AM Monday, April 8, 2019 at the Brewer Chapel of Brookings-Smith, 55 South Main Street, Brewer. Provide comfort for the family of Sharon Ann Millett (Hurd) by sending flowers.